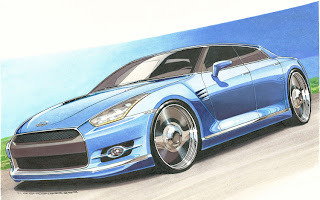 Home > Motor Trend > A Four door Infiniti based GT-R Supercar ? "A senior Nissan source has confirmed the company is studying the possibility of producing a high-performance four-door sedan based on the exotic Nissan GT-R hardware. The source suggested the car may be sold as an Infiniti. "Producing a four-door GT-R is certainly feasible, though it wouldn't be cheap. Although the GT-R coupe is based on Nissan's flexible FM (front midship) platform, it is what one analyst calls "a major deviation" from that platform's architecture, to the point where it's known internally as PM (premium midship)."